El equipo de noticias escolares está buscando voluntarios para editar y traducir a Español. Esta es una manera fácil de ayudar a que todas las familias de MX tengan acceso a la información sobre las actividades y programas de nuestra escuela. Esta es una posición flexible que te permite contribuir desde tu computadora en tu propio horario. Todo lo que necesitas son unas cuantas horas al mes y acceso a Microsoft Word. Si te interesa participar, por favor comunícate con Tenysa Santiago, Coordinadora de las Noticias Escola coordinator.fridaynews@gmail.com. Missed out on some auction items? Looking for gifts/presents for others? Still need some camps for summer? We have you covered! You have one more chance to grab some items and raise a few more dollars for Malcolm X! The MX Auction Fire Sale is LIVE NOW and will run until 5 p.m. this Friday 3/15. Lots of Parties & Playdate spots available: Girls Night Out: Brows, Bites and Bubbly, Murder Mystery Dinner Party, Wine Tasting at Vintage Berkeley. For kids: Rocket Maker Party, Sweet Treats with Ms. Cannon, and Berkeley Bicycle Scavenger Hunt to name a few. And don't miss out on a "GO MX!" card deck designed by 2nd graders in Ms. Abdolhosseini's/Ms. Arroyo's class - plays exactly like the game Go Fish! but with nine different MX school themes, only $20. Te perdiste de algo en la subasta de MX? Estás buscando regalos? Todavía necesitas campos de verano? Aún estás a tiempo de escoger éstas cosas y además recaudar más dinero para Malcolm X! La subasta de MX está activa desde ahora hasta las 5pm del Viernes 15 de Marzo. Todavía hay muchos lugares para fiestas y playdates como Noche de Chicas: Cejas, Botana y Burbujas, Cena del Asesinato Misterioso, Cata de Vino en Vintage Berkeley. Para niños: Fiesta de hacer cohetes, Postres con Ms. Cannon, y la buúsqueda del tesoro en bicicleta, por nombrar algunos. Y no te pierdas de "GO MX!" el juego de cartas diseñado por el grupo de 2do grado de Ms. Abdolhosseini's/Ms. Arroyo, se juega exactamente como Go Fish! pero con 9 temas diferentes de MX, por sólo $20. Old toys, puzzles, games, books causing clutter at your house? Donate them to be used as SPRING FAIR PRIZES! We would *greatly* appreciate gently used, clean, unbroken items suitable for TK to 5th grade ages. To donate: Just look for the plastic donation bins located in the PTA corner of the school office. Please secure loose pieces and/or box lids before placing items in a donation bin. Rolling donations will be accepted from now until Spring Fair. Looking for toy decluttering/spring cleaning inspiration? Regala los juguetes que ya no uses! Tienes juguetes viejos, rompecabezas, juegos de mesa,y libros que ya no necesitas en casa? Dónalos a la escuela para utilizarlos como premios de la Feria de Primavera! Con mucho gusto recibiremos juguetes limpios en buen estado apropiados para niños de TK hasta 5to grado. Por favor cierra bien las cajas y asegurate que todas las partes de tu donativo esten dentro del contenedor antes de cerrarlo. Se aceptan donativos desde ahorita hasta la Feria de Primavera. En búsqueda de inspiracion para limpiar tus juguetes? This March and April, Good Eggs will donate 5% back to Malcolm X Elementary School every time you shop. Enroll in the fundraiser by visiting schools.goodeggs.com, entering the code MALCOLMX, and placing an order. Good Eggs is an online grocery market in the Bay Area delivering absurdly fresh groceries. Shop today for same-day delivery straight to your doorstep — no subscription or long-term commitment required. Delivery is free on all orders over $60. En Marzo y Abril, Good Eggs donará el 5% a Malcolm X cada vez que hagas una compra. Inscríbete en la recaudación al visitar schools.goodeggs.com, utiliza el código MALCOLMX, y engarga tu orden. No has probado Good Eggs? Te descuentan $15 en tu primera orden al registrarte! Good Eggs es un mercado en linea en el Area de la Bahia que entrega articulos frescos. Compra en linea y recíbelo en casa el mismo dia, sin necesidad de suscripciones o compromisos a largo plazo. La entrega es gratis en todas las oórdenes mayores de $60. Celebrate Pi Day MX-style with a pie baking contest, STEM panel and PTA general meeting on Thursday, March 14, from 6-8 PM. We will be celebrating with pizza pies and dessert pies. Free dinner will be provided by the PTA, but anyone who would like to bake a homemade pie is encouraged to bring one and enter our second annual Pi(e) Day Baking Contest. The contest "judging" will take place just before our Pi Day Panel. The Pi Day Panel will be a Q&A session with current UC Berkeley students from SWE (Society of Women Engineers), Hispanic Engineers & Scientists (HES) and other student interest groups. Teachers, parents and students are all invited to attend and engage with the panel as we talk about STEM (Science, Technology, Engineering & Mathematics) and how to support math and science learning (and experimenting and playing) in the younger grades when kids are just beginning to form ideas about what they are "good" at and which subjects they like and enjoy the most. If you are interested in encouraging your child to explore and find success in STEM/STEAM subjects, or you just like pie, we hope you will be able to join us. Are old toys, puzzles, games, or books causing clutter at your house? Donate them to be used as SPRING FAIR PRIZES! We would greatly appreciate gently used items suitable for TK to 5th grade ages. To donate: Just look for the plastic donation bins located in the PTA corner of the school's main office. Please secure loose pieces and/or box lids before placing items in a donation bin. Rolling donations will be accepted from now until Spring Fair. The Family Food Pantry and food bag packing are still happening on the 2nd and 4th Friday of every month. Bring a bag to the pantry across from MX at the South Berkeley Senior Center between 2-4 pm to shop for produce and non-perishable groceries. Can’t make it but still need food? We can pack a bag for you and deliver it to the school. Contact Jocelyn Foreman at Jocelynforeman@berkeley.net. Volunteer with us! We can always use help packing bags and delivering to BUSD schools. Contact Heather Ball at heather.ball@mxpta.org. Lace up those shoes, dust off those bikes, or get ready to share your ride! The Safe Routes to Schools Pollution Solution 2019: Golden Sneaker Contest runs through Friday, March 8th. Participating classrooms will be tracking and talking about the benefits of using active transportation—walking and rolling (biking, skateboarding, or using a scooter) or shared transportation (riding the school bus, using public transportation and/or carpooling with other families)—to come to school. To find out more details or to get involved contact coordinator Tim O'Keefe at toktoktim@gmail.com. 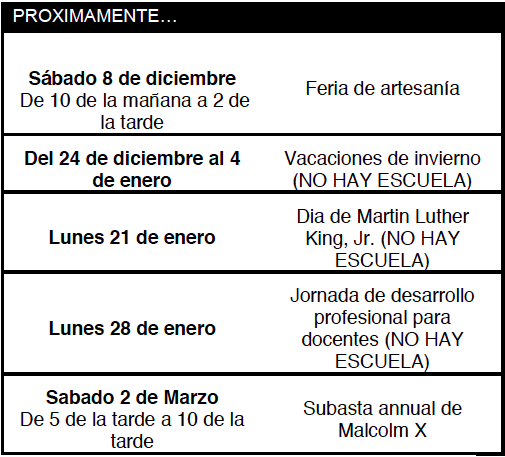 ¡Malcolm X School News te quiere! ¡El Equipo de Noticias Escolares está buscando editores voluntarios y traductores de español! Servir como editor o traductor es una manera bastante fácil de asegurar que todas las familias de MX aprendan sobre las actividades y los programas en nuestra maravillosa escuela. Esta es una posición flexible que le permite contribuir desde su propia computadora, en su propio tiempo. Todo lo que necesita es unas pocas horas al mes y acceso a Microsoft Word. Para preguntas o más información: Tenysa Santiago, coordinator.fridaynews@gmail.com. Come out to Berkeley High on Saturday, March 2, from 1 to 5 pm, for the 8th Annual JazzGirls Day. This free event is open to all girls ages 10-14 and is being held to encourage and mentor girls who are interested in playing or singing jazz. It is a great way to meet other female musicians, get inspired and gain confidence. Participants will join professional female jazz musicians and educators for master classes and jam sessions. It takes place in the Community Theater. No pre-registration required. Check-in starts at 12:30 p.m.
JazzGirls Day is a fantastic opportunity to network, learn more about opportunities to play jazz and share stories with other female musicians, young and old. Come out and join this fun and empowering event! For questions or more information: berkeleyhighjazz@gmail.com. Venga a Berkeley High el sábado, 2 de marzo, de 1 a 5 pm, para el octavo día anual de JazzGirls. Este evento gratuito está abierto a todas las niñas de 10 a 14 años de edad y se lleva a cabo para alentar y guiar a las niñas que estén interesadas en tocar o cantar jazz. Es una excelente manera de conocer otras músicas, inspirarse y ganar confianza. Los participantes se unirán a músicas de jazz y educadoras profesionales para las clases magistrales y las sesiones improvisadas. Tiene lugar en el teatro comunitario. No se requiere preinscripción. El registro comienza a las 12:30 p.m.
JazzGirls Day es una fantástica oportunidad para establecer contactos, aprender más sobre las oportunidades para tocar jazz y compartir historias con otras mujeres músico, jóvenes y mayores. ¡Ven y únete a este divertido evento! Para preguntas o más información: berkeleyhighjazz@gmail.com. Since the PTA is not allowed to spend funds on alcohol, we are looking for parent donations to fund liberal libations. Your contributions help us generate more money for the school and ensure that there will be tasty cocktails, beer and wine on hand to enhance the evening's fun. Contact: Haia Sophia at haiasophia@gmail.com or 415-640-8827 to donate. Como la PTA no tiene permitido gastar fondos en alcohol, estamos buscando donaciones de padres para financiar libaciones liberales. Sus contribuciones nos ayudan a generar más dinero para la escuela y aseguran que habrá deliciosos cócteles, cerveza y vino para realzar la diversión de la noche. Póngase en contacto con: Haia Sophia en haiasophia@gmail.com o 415-640-8827 para donar. Questions? Email Maria at maria.mclaughlin@mxpta.org. Last Call for MX Auction Donations! Last chance to donate your auction items for Gatsby Night! MX PTA Auction and Dance Party. Art, jewelry, home-cooked dinner homemade or ice cream, etc. Host an event or party for kids or adults: 5, 10 or 30 people! These are super fun events where you can meet other MX families and raise lots of money for the school! Sponsors, It’s Not Too Late! As always, everyone is welcome! Do not let finances be the reason you don’t attend. Free admission and childcare can be arranged, please email mxauction@gmail.com to be on the guest list and there is absolutely no requirement that you bid or spend money. ¡Última convocatoria para donaciones de la subasta de MX! Última oportunidad de donar sus artículos de la subasta para Gatsby Night! MX PTA Subasta y Fiesta de Baile. • Arte, joyería, cena casera o helados, etc. • Un servicio profesional o un certificado de regalo. • Organice un evento o una fiesta para niños o adultos: 5, 10 o 30 personas. ¡Estos son eventos súper divertidos donde puedes conocer a otras familias de MX y recaudar mucho dinero para la escuela! Patrocinadores, ¡No es demasiado tarde! Como siempre, todos son bienvenidos! No permita que las finanzas sean la razón por la que no asiste. Se pueden organizar entradas y guarderías gratuitas, envíe un correo electrónico a mxauction@gmail.com para estar en la lista de invitados y no hay absolutamente ningún requisito de que haga una oferta o gaste dinero. …and so much more! Our Malcolm X Lost and Found is full to overflowing, and all unclaimed items will be donated over Winter Break. Make that sweater, t-shirt, or lunch box the happiest sweater, t-shirt, or lunch box in the world: reunite it with its kid today! Stop by the Lost and Found at the base of the stairs between the Kindergarten hallway and the cafeteria. y muchas cosas mas.......Nuestro apartado de Perdido y Encontrado esta completamento lleno y rebozando, y todos los articulos que no sean reclamados seran donados durante las vacaciones de Invierno. Haga a esa chamarra,sudadera o lonchera,la chamarra,sudadera o lonchera mas feliz del mundo: reunala con su niño(niña) hoy!!! Detengase en nuestro apartado de Perdido y Encontrado en la parte baja de las escaleras localizadas entre el pasillo del Jardin de Niños y la cafeteria.